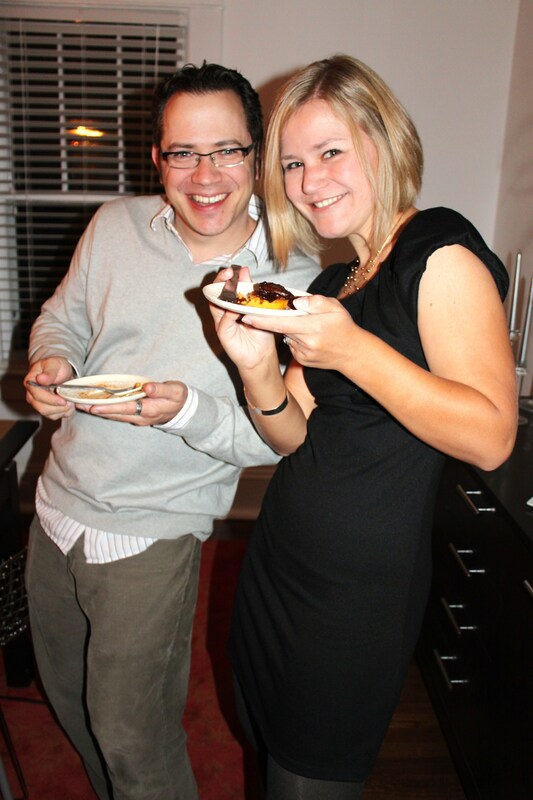 Our entertaining saving grace came in the form of two special friends on Saturday night – Masha and Mark. After one mention of borrowing a table-cloth, Masha took it upon herself to make an entire table arrangement out of paper. She used brown craft paper to cover the table and purple and yellow paper cut in various ways to add a festive component (somewhere between Mardi Gras and New Years). It was a great contrast to my china and silver. It is good to have such a creative and generous friend. Additionally, Mark stepped up as sommelier for the evening – pairing each course and providing the wine for everyone. Here are his notes. The wine was great – if you decide to make any of these dishes please also considering matching with these wines. We are quite the team. Mache and Radish Salad paired with Perle d’Aurore Rosé Brut. Salmon and Crispy Bason Lentils with Angeline Pinot Noir California, Matariki Pinot Noir Hawkes Bay and The Crossings Pinot Noir. Apple Fritters and Bourbon Ice Cream with Quinta de Ventozelo. After Dinner Game of Catch Phrase with Edgewood Tradition Napa Valley and Finca Flichman Malbec Tupungato. are photos of this lovely table setting upcoming??? Really love the addition of the wine paring information. I think that it should be included in your posts more often. I also like the ability to see the cost and availability via the hot link. Really love the addition of the wine paring information. I think that it should be included in your posts more often. I also like the ability to see the cost and availability via the hot link. For those of us who need direction with our wine pairings, this is a big help.